HomeStrategyPoker GuideWho Are The Most Popular British Poker Players? Britain is blessed with a plethora of poker talent with the men and women who call the UK home amongst the best online and live tournament players on the planet. One of the most prominent and successful British poker players is Sam Trickett. A former semi-professional footballer whose career was prematurely ended by injury, Trickett turned to the felt and has never looked back. The 27-year-old has over $20 million in live tournament winnings and is the all-time live tournament money winner in Europe. In 2012, the Nottingham- born star paid $1 million to enter the biggest buy-in even in History: The BIG ONE for ONE Drop at the WSOP. It turned out to be the best investment of his life as Trickett secured a mammoth $10.1m win after he finished runner-up to Antonio Esfandiari. It’s not only live tournaments that Trickett excels at. He is a regular in the biggest cash games in the world and has won countless more millions playing online. You can even play with Trickett at Everest Poker where he is an Ambassador. 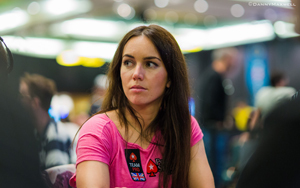 Former astrophysics graduate and heavy metal fan Liv Boeree made a sudden career change when she decided to turn to poker after being coached by pros Phil Hellmuth and Annie Duke. In 2008 she made her breakthrough by winning the Ladbrokes Poker European Ladies Championship for $42k- a landmark moment in UK poker. Two years later Liv became only the third women in history to win a European Poker Tour event, taking down a field of 1,240 opponents to win $1.7m at the EPT San Remo. Nowadays you can find the 29-year-old beauty travelling the tournament circuit, playing on Pokerstars.com or bizarrely hanging out with her bearded dragon pet lizard. Keep your game razor sharp with our free poker strategy articles and videos. It’s not just Sam Trickett and Liv Boeree who have been flying the British flag across the poker world. There are hundreds of other talented poker players from the UK with long lists of exploits and achievements. Toby Lewis, Roberto Romanello, Zimnan Ziyard, Rupert Elder, David Vamplew and Tom Middleton have each won a European Poker Tour title, while Jake Cody has a coveted Triple Crown of titles – a European Poker Tour, World Poker Tour and World Series of Poker bracelet. At the virtual felt we have such luminaries as Chris Moorman – the only online tournament player to have won more than $10 million – Christopher Brammer, Patrick Leonard, Richard Trigg and many more. Each week, UK & Ireland PokerNews takes a look at the top 20 players in the United Kingdom based on the Global Poker Index ranking system. The top 20 are ranked for their online poker performances and all their big wins and near misses are reported. Will you join the British poker elite and make it onto one of our reports? Sign up to an online poker site via our links and you could very well feature on the PokerNews pages!